January 19, 2014 by Tveen Verano in Random Foodie Finds! So, my boyfriend is pretty awesome at planning dates. No really, he never takes me anywhere that I have been before. He knows how much of a foodie I am, and always tries to pick places that are new, different, and that I would like. He spends time researching, calling restaurants, looking up menus, and doing extensive background checks on all the restaurants in our lovely LA area! 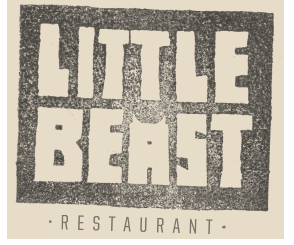 Last night, we went to a little spot in Eagle Rock, CA called "Little Beast," and let me tell you, the flavors we experienced here were FAR from little! The menu was very extensive and upon being seated we were informed that they change it seasonally, which always makes my ears perk up. Usually this means that the restaurant uses organic, fresh, local produce and supports natural foods. And I was right! The waiter told us their chicken dishes organic, and they had a variety of vegetables offered with every dish. After much deliberation, we decided to get the Burrata and Prosciutto and Crispy Sweet Potato as appetizers, and we also decided to split one of their entree options: Slow Roasted Jidori Chicken. 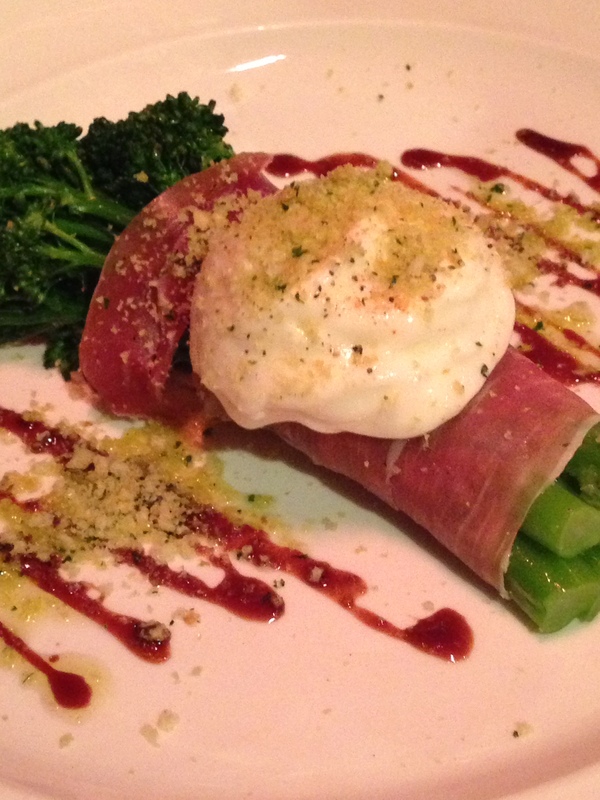 The burrata appetizer was broccolini wrapped in prosciutto and topped with this creamy, gooey burrata cheese. This dish was so good and incredibly rich! 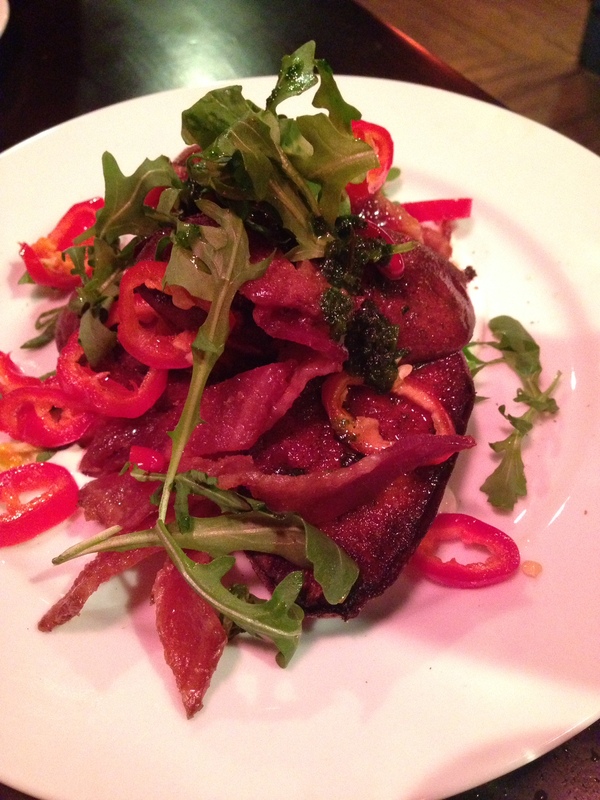 But, the main star for us was the crispy sweet potato appetizer.. Words do NOT describe how much I loved this dish. There were crispy sweet potato disks on the bottom, which were then topped with brown sugar sweet apple bacon bits, covered in jalapeño and arugula. Oh. My. Gosh. I could not get enough. The combination of the bacon with the sweet potato was to die for (and I don't even like bacon)! I felt like my mouth was doing a little dance of happiness every time I took a bite. 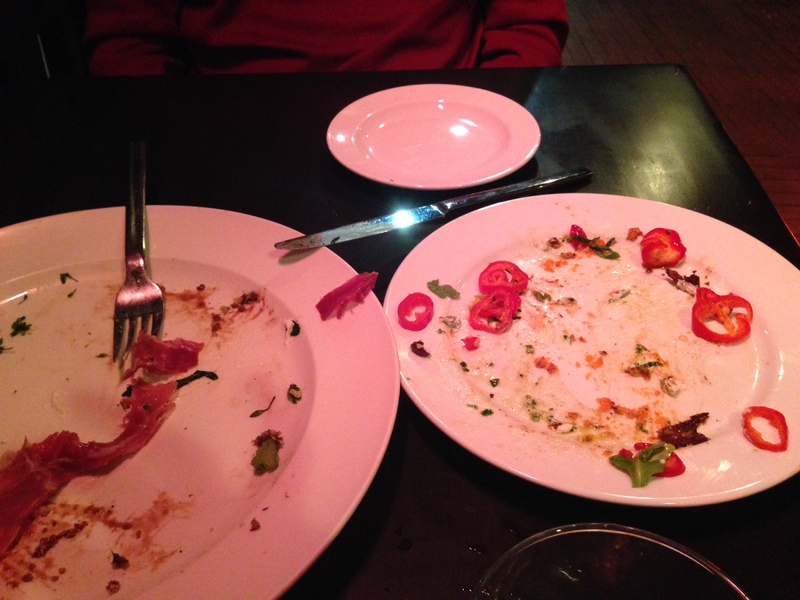 Clearly, we liked both appetizers, but my favorite was definitely the sweet potato one! 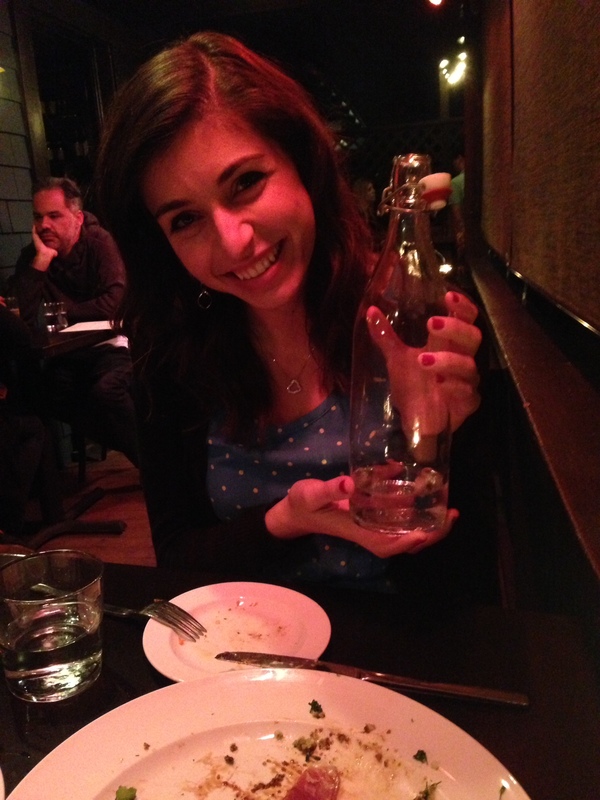 Side note: I also LOVE when restaurants give you cold water in a glass bottle that you can leave ON YOUR TABLE! B.) Because for some reason water always tastes so much better from a glass bottle! Finally, our dinner came. They had pre-split the plate for us, so the pictured portion below is technically just HALF of their actual portion. The dish was topped with the same sweet bacon as our appetizer was. The chicken was literally falling off the bone. It was cooked perfectly with an amazing au jus sauce covering it. 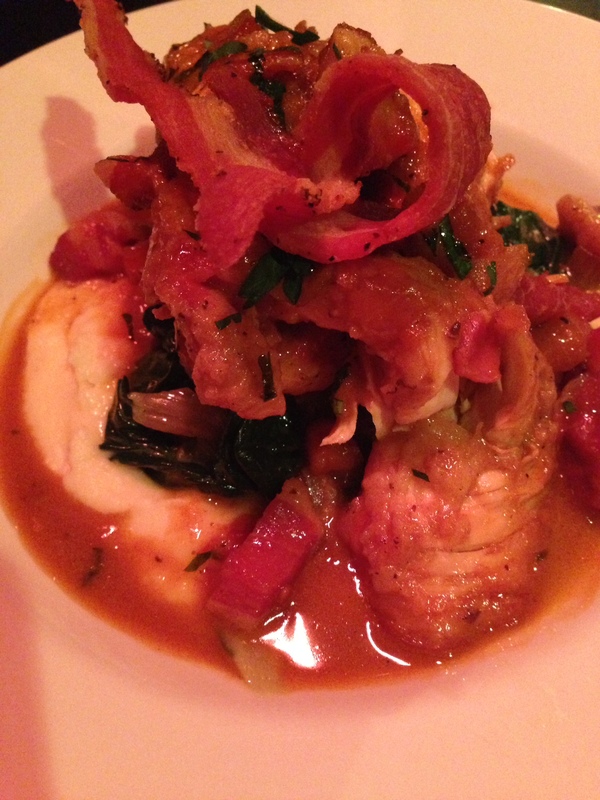 They had placed the chicken on a bed of parsnip mash, which basically exactly like mashed potatoes! The dish also had swiss chard. The combinations of these foods together were basically like one big bowl of comforting goodness. 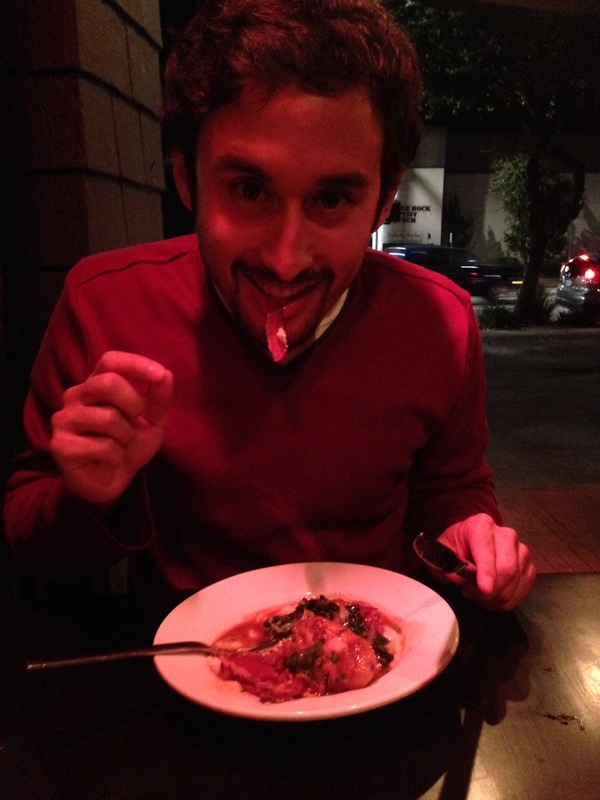 My boyfriend loves comfort foods that are mashed and mushy, so he was definitely a happy camper! By the end of the meal, we were both STUFFED. But our stomachs were singing with happiness! This restaurant was the perfect spot for a nice date night, with good food as well as good service and a nice ambiance! We even got to enjoy the patio seating because of their heaters (which worked very well I might add). If you live in the area, I highly recommend that you try it out! Have a wonderful Sunday night folks!